All parents know how delicate and fragile babies skin can be, it's thinner than ours which means it loses moisture easily and can become quite dry if you aren't careful. From the moment they are born, it really pays to be conscious of how you take care of their skin; they need the most gentle cleansing to make sure their skin remains healthy and protected. 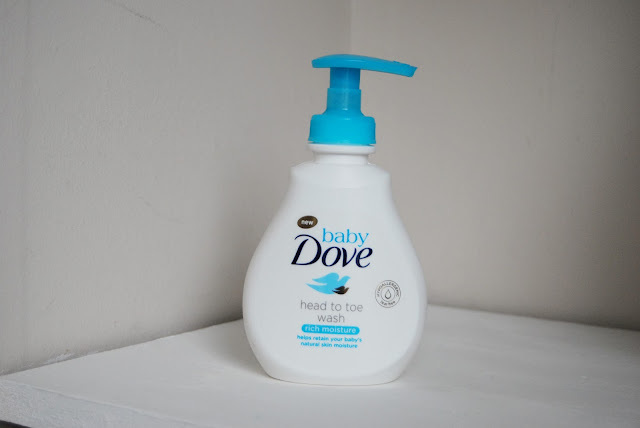 Dove has been a leading retailer in skin care for the past 60 years and they recently developed a brand new range, aimed at children with normal to dry skin. Introducing, Baby Dove! Included in this range is everything you need to take total care of your baby’s skin. The products are; Baby Dove Rich Moisture and Baby Dove Sensitive Moisture (fragrance-free) Head to Toe Baby Wash, Baby Bar, Shampoo, Lotion, Nappy Cream and Wipes. The entire Baby Dove range is dermatologist tested, paediatrically approved, and plus the Head To Toe Baby Wash is also pH neutral and clinically proven to be as mild as water. This range isn't just mild on delicate skin but it also helps to replenish essential moisture and nutrients too. We were recently invited to try out our pick of two products for the new range, whichever would be the most suitable for Ava. I opted for the Baby Dove Head to Toe Wash and the Lotion. I thought they would both be great to try out for the first time during our bath, book and bedtime routine. I always check the labels on the products that I use on my children's skin and when it comes to using them I only use the smallest amount of product, as it's all their skin needs. I also found that bathing them every other night, rather than every night helps prevent their skin from drying out and lets the natural oils get back into their hair and skin. 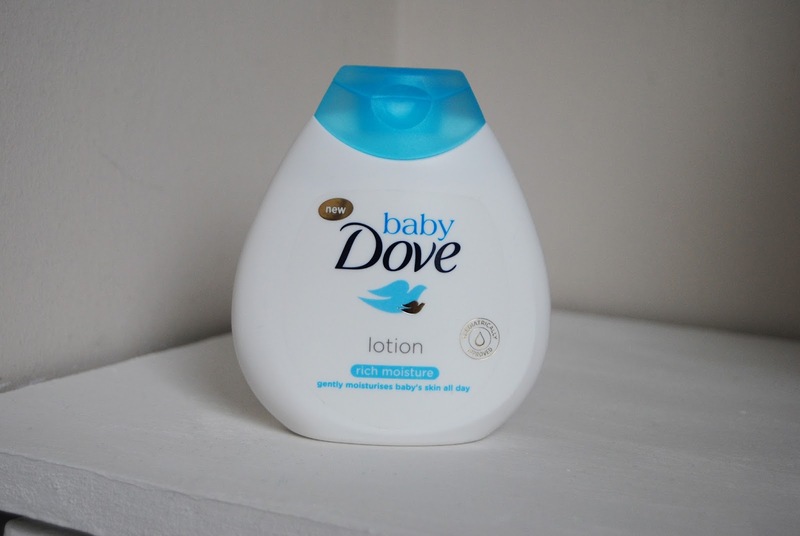 Baby Dove is however gentle enough to be used daily, even on newborn skin. We were very happy with the two products we received and would definitely buy them again as they provide exactly what's promised - total care of my little ones skin. I also adore the gentle scent of the products which is described as a "hugs and kisses" fragrance however if you prefer your products fragrance-free I'd recommend the Sensitive Moisture range rather than Rich Moisture products. Prices for the Baby Dove range start at RRP £1.25 and it can be purchased online and in store at most leading retailers. Head over to the Baby Dove website for the full information and more details. - In sponsorship with Baby Dove. Thanks for the information. We are fond of Dove products as a family. The baby range is news to me, will look out for it. 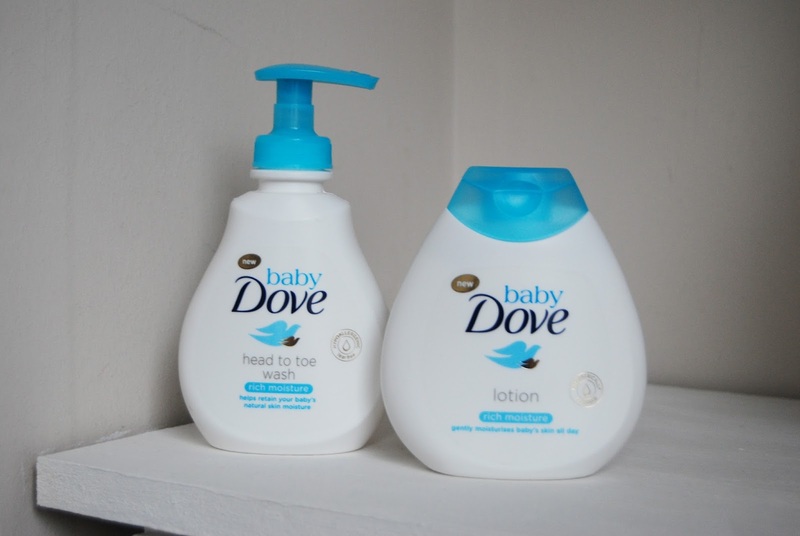 I never new Dove had a baby range. Sounds lovely. I usually always use Johnson but will love to try this range. I didn't know this existed - might have to give it a go! It sounds like a fab range!